A close friend told me about this newly published book, as her family was acquainted with the author, Leon Leyson, who was the youngest person on Schindler’s List. Dr. Leyson apparently resided right here in my town for years and years, taught high school for nearly four decades, and gave talks and lectures recounting his experience living through the Holocaust. Mr. Leyson passed away this past January, apparently before ever seeing his book published. 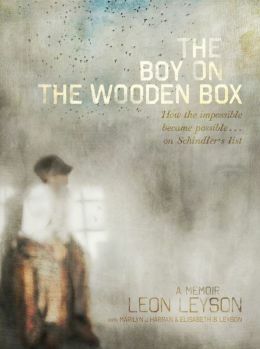 Leyson was the youngest of five children from a working class Jewish family in Poland. He spent the first several years of his life living a somewhat idyllic existence in the countryside of Poland. When he was nine, his father moved the family to the city; it was to be a new beginning with exciting opportunities. Only, their dreams quickly crumbled when WWII broke out and the Nazis made their way into Poland, gradually but quickly stripping Jews of the civil rights, their property, their dignity, and their freedom. By the time Leon was ten, his family, along with thousands of other Jews, were moved to the ghetto – an extremely overcrowded corner of the city enclosed by high walls and Nazi guards, where food was scarce, disease rampant, and fear as ever-present as breathing. Often, Nazis would storm the ghetto, beating and murdering people at random, and eventually, the ghetto was steadily “liquidated,” as its inhabitants were forcibly transferred to labor camps and death camps. Leon’s father was employed at Oskar Schindler‘s factory, though, which afforded the family some protection from the Nazis. Schindler, a Nazi himself, was a complex man – a spy, an opportunist, a womanizer, an alcoholic, who, against all odds, made it his personal mission during the war to save as many Jews as he could. He managed to save most of Leon’s immediate family, but they still spent time under horrific conditions in work camps under Nazi control, where surviving the next hour became the only focus. Geared towards “young readers,” this book, nonetheless, describes in unflinching terms the horrors that the Leyson family, and hundreds of thousands of other Jews suffered at the hands of the Nazis. It’s a powerful read, and one I highly recommend.